The Supreme Court has struck down a key provision of the Defense of Marriage Act forbidding federal recognition of gay marriages for couples residing in states that recognize their union. The court’s decision came by a ruling of 5-4. The ruling is one of two major gay marriage rulings being considered by the High Court. 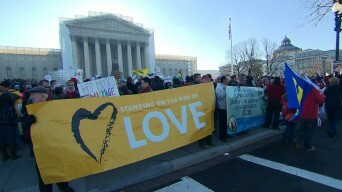 The court is also ruling on Proposition 8, California’s anti-gay marriage law.